DAVID LE/Staff photo. 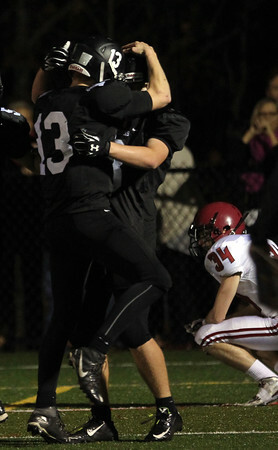 Marblehead senior quarterback Garret Keough (13) celebrates a long Magicians touchdown with Harry Craig after Craig beat Gloucester's Patrick Goss (34) down the sideline. 11/6/15.